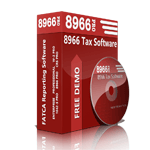 FATCA reporting software and services. Increase number of transactions supported by your 8966 Professional software. All 1099 Pro software support a default number of transactions (records). Organizations requiring more transactions than normal can purchase additional transactions in groups of 1000. When you purchase additional transactions, you will be issued a "bump code". This bump code must be entered into your 1099 Pro software to make your software aware of the additional transactions. Your bump code will be sent to you via email when your order is processed.